1. Preheat oven to 200°C/400°F/Gas Mark 6. 2. 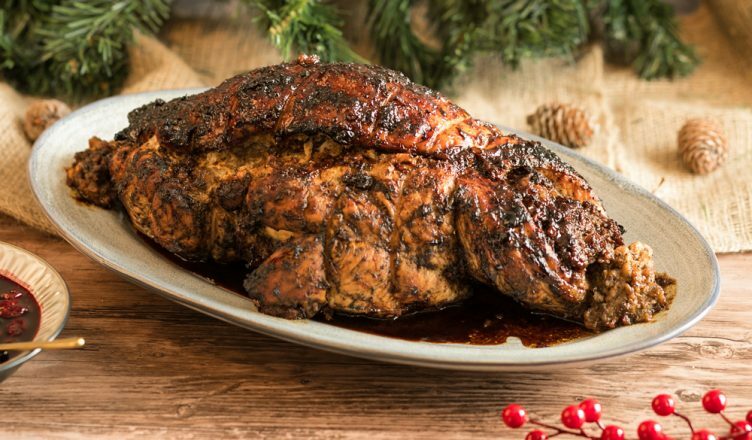 Lay turkey breast onto a flat surface, cover with cling film, then use a rolling pin or meat tenderiser to flatten and even out meat. 3. Place the stuffing down the centre and carefully, tightly roll it up. Use kitchen string to tie it in at 2.5cm intervals. 4. Place the stuffed, tied breast in a roasting tin. Rub all over with melted butter, season with the jerk seasoning, making sure you work it into all the folds and crevices. 5. Cover with tin foil and roast the turkey breast in the middle shelf of the oven for approx. 2 hours (40 mins per kg). 6. Every now and then use the maple syrup, orange juice and jerk seasoning to baste the turkey. Check that it’s cooked by inserting a metal skewer to the centre. If it’s red hot when it comes out and the juices run clear, the meat is cooked. 1. Sweat the onion in the oil, until soft but not coloured. 2. Mix together the onion, thyme, bay leaves, pimento, garlic and breadcrumbs and season well. 3. Add enough of the beaten egg to bind the mixture together and use to stuff the turkey breast. 1. Put the sorrel buds and water into a pan, bring to the boil and then simmer for about 30 mins. 2. Stir in the cranberries, orange zest, sugar and red label wine, then simmer until berries are tender and slightly losing their shape (this will take about 5 mins if using frozen cranberries or 8-10 mins if using fresh). 3. Leave to cool, the sauce will thicken as it does. 4. Serve at room temperature. Enjoy.